Two weeks ago, nisīmis (my younger sister) lent me $40. 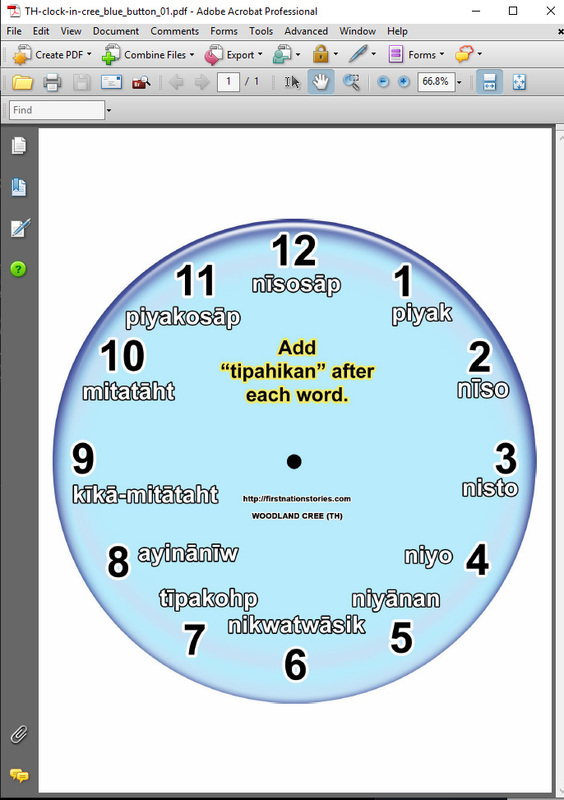 Last week, I showed her my Woodland Cree clock and told her maybe I should make them with personal pictures as a background. She thought it was a good idea and then asked me to make her a clock with her sons as the background to pay for the $40 bucks I owe her. I agreed and worked on it last night. I had the picture laminated and placed it in a document frame. I took the glass out and replaced it with the laminated picture. It turned out okay and looks good. 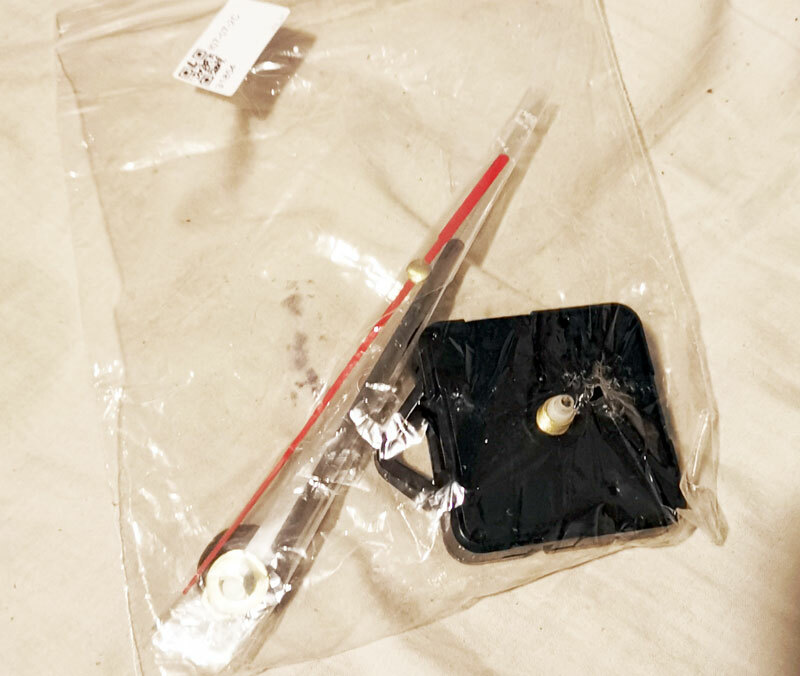 I choose a light plastic frame which is light enough to be held up by a thumb tack. I just thought I would share the story and maybe give some ideas on what can be done with a custom clock. Have a good evening. maybe next time, I will try an 8×10 frame, this was an 8.5×11 frame so I would not have to cut the laminated picture. At the time of the incident, I was about 7 or 8 years and nīstāw (my cousin), James, was 8 or 9 years old. nimosōminān – (our grandfather) was getting ready to go somewhere when James and I decided we were going to follow him. He looked at us, “hāw māka, sipwītihtān” – (okay, let’s go), he said. It was late winter, and the weather was warming up, but this morning was cool enough to harden the snow. The place he was going, was across the lake from our cabins, David’s cabin. David was an old friend of our grandfather’s and many times he would go visit him and have tea or coffee. 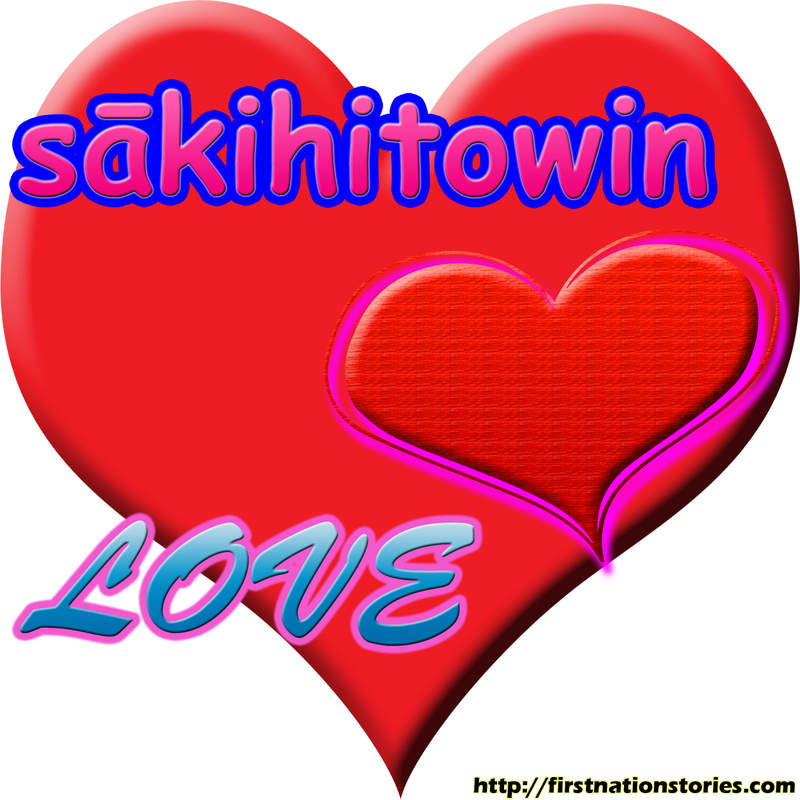 tī iwī nitowi minihkwīyān – (I’m going to go drink some tea). nimosōminān was walking far ahead of us while nīstāw and I were wrestling and joking, typical boys horsing around. We were about halfway through the lake when suddenly, crack! We fell through the ice, one leg each. His left leg and my right leg. I was almost up to my knee, while nīstāw fell past his knee. We fell forward, as he grabbed me to keep himself from going in. We got out safely and stood up to assess ourselves. Up ahead, nimosōminān stopped to look back, saw that we were okay and then kept on walking. When we got to David’s cabin, nimosōminān mentioned to us that maybe we fell into a water hole in the ice. 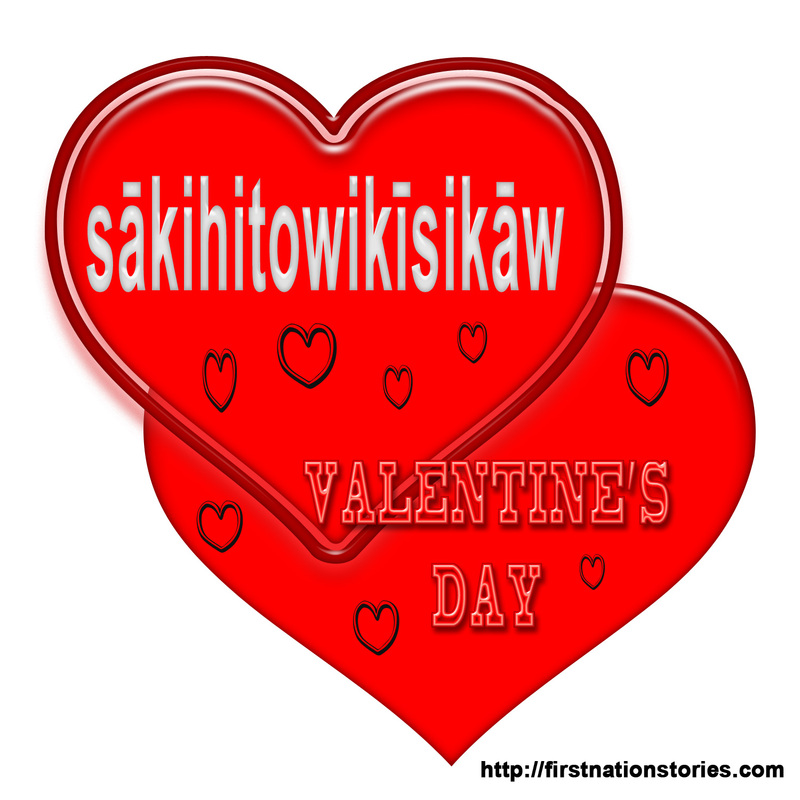 “matwāncī ikī pōsipathīk pīkwatahōpānihk” – (I wonder if you could have fell into a water hole in the ice?). 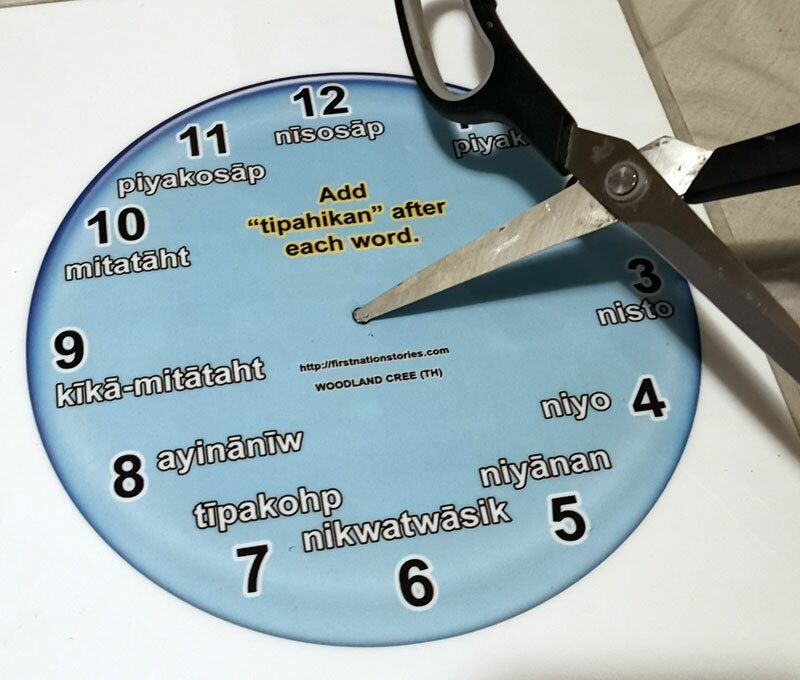 “namōwitha osām kayās dīpit iki twāhahk pīkwatahōpān.” – (It was not too long ago, that David chiseled a water hole in the ice). James and I didn’t think so because most pīkwatahōpāna would be too small to fit two legs, maybe one leg but not two. I don’t remember if we tried finding it again because like I said, it was late winter, and the ice crusted snow was hard, and we could not find our exact trail. To this day, we still do not know what we fell into, but the ice did crack and maybe it was just a weak area. We didn’t stay at the scene at the time because we panicked and ran to go warm-up in David’s cabin. 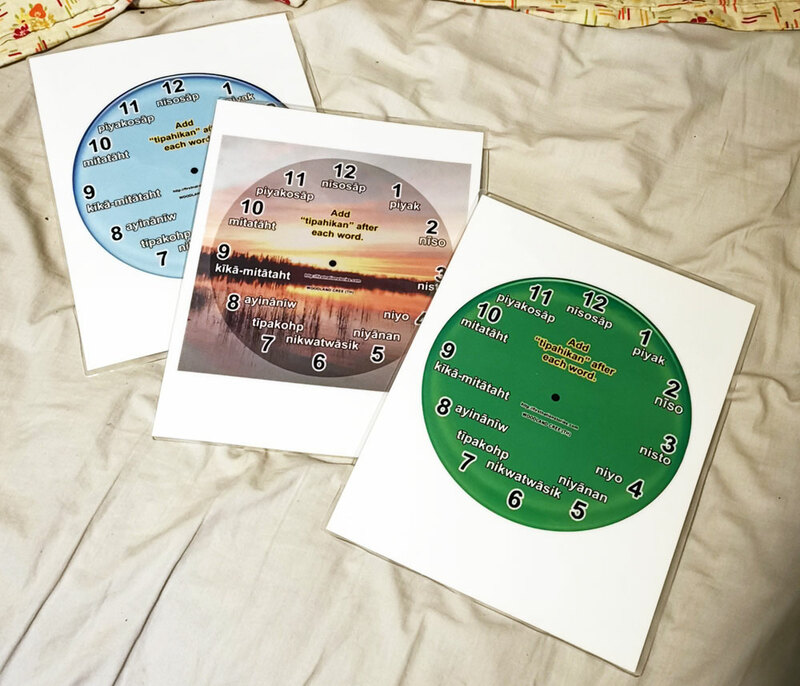 Since my previous post, I MADE MY OWN WOODLAND CREE CLOCK, I went to a printing business and got 3 different clocks printed out and laminated. 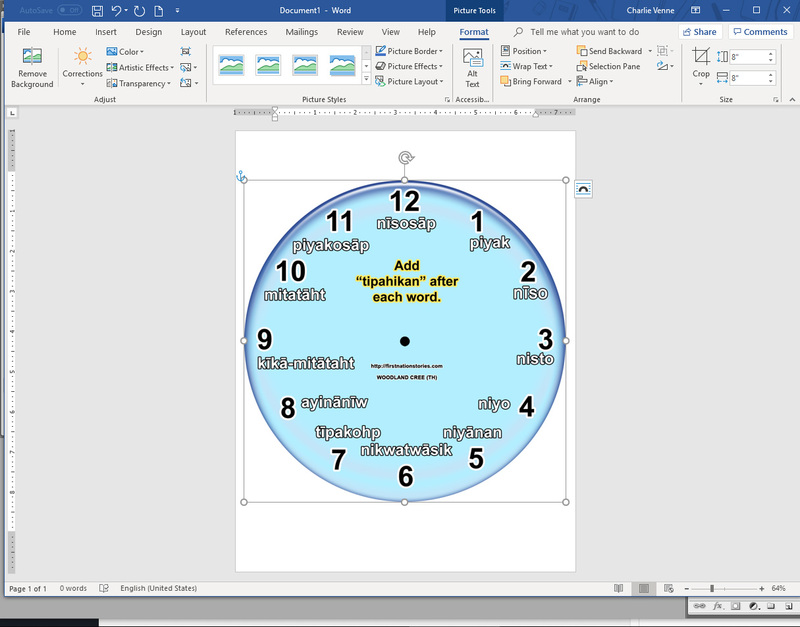 First, I had to insert the images into a WORD document and then [Wrap Text] to [In Front of Text] to resized the image to 8′ inches and centred it. 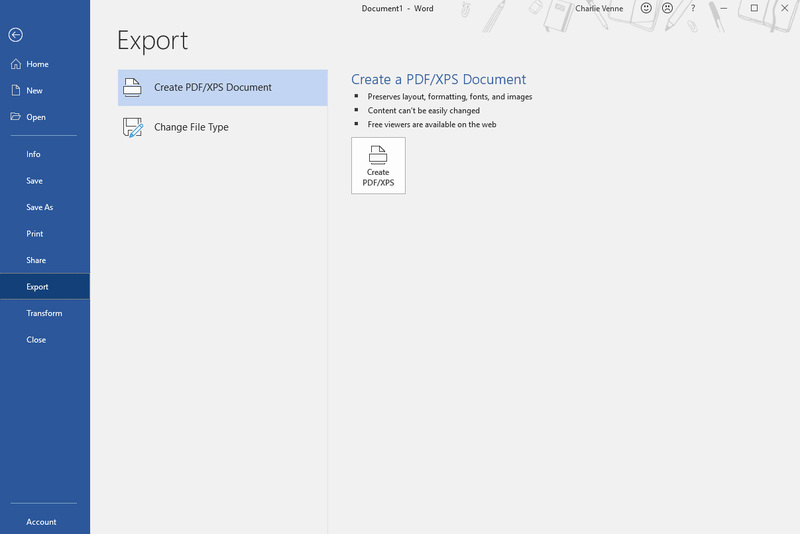 I then Exported it as a PDF and saved to a thumb drive. 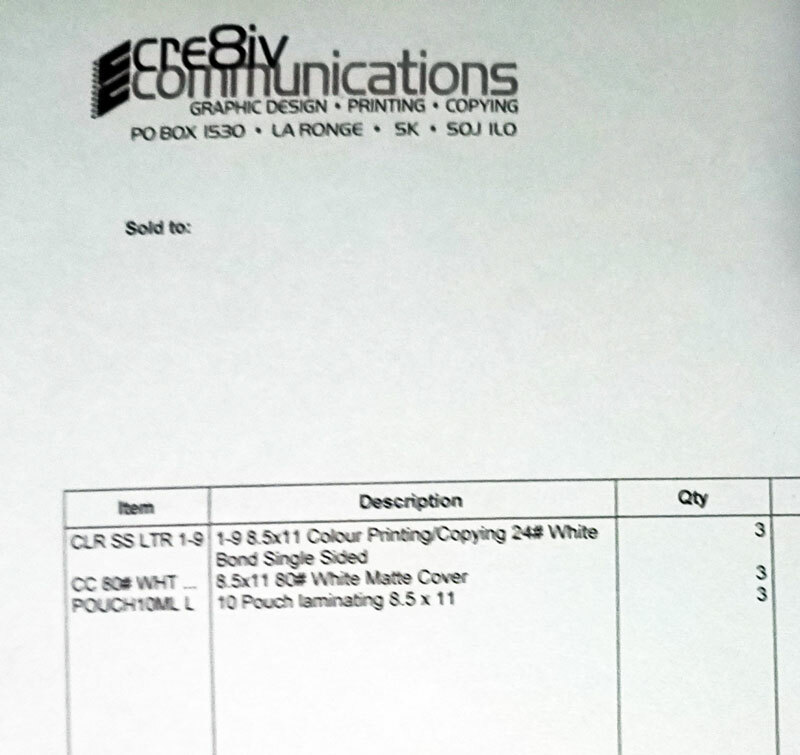 I got them printed with the settings shown on the receipt above. Here they are, printed and laminated. I got my DIY CLOCK TOOLS and put a hole in the middle of the clock and cut around it (I didn’t do the best job but a more craftier person could do a better job, I’m sure). Here is the finished product, all it needs is a battery. 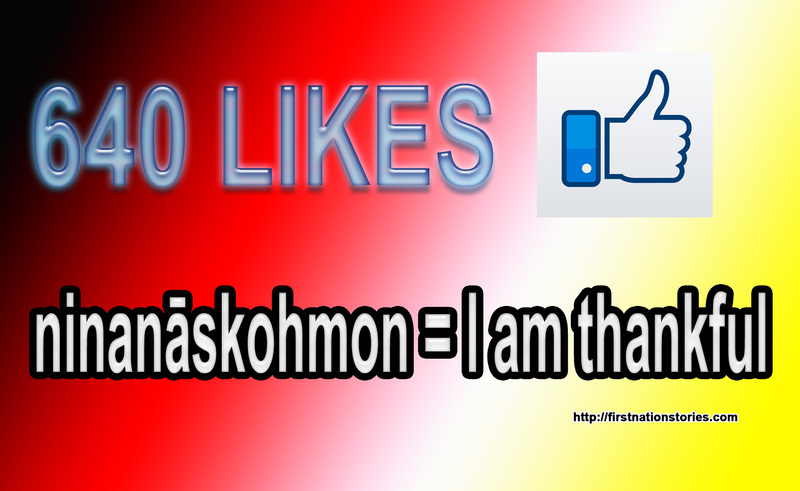 Please like and share. I saved it to my downloads page, printed it. I used Matte paper and the settings you see on the image below. Thank you for viewing. I would also recommend laminating the printed clock, even if it is on matte paper. It would most likely last longer. 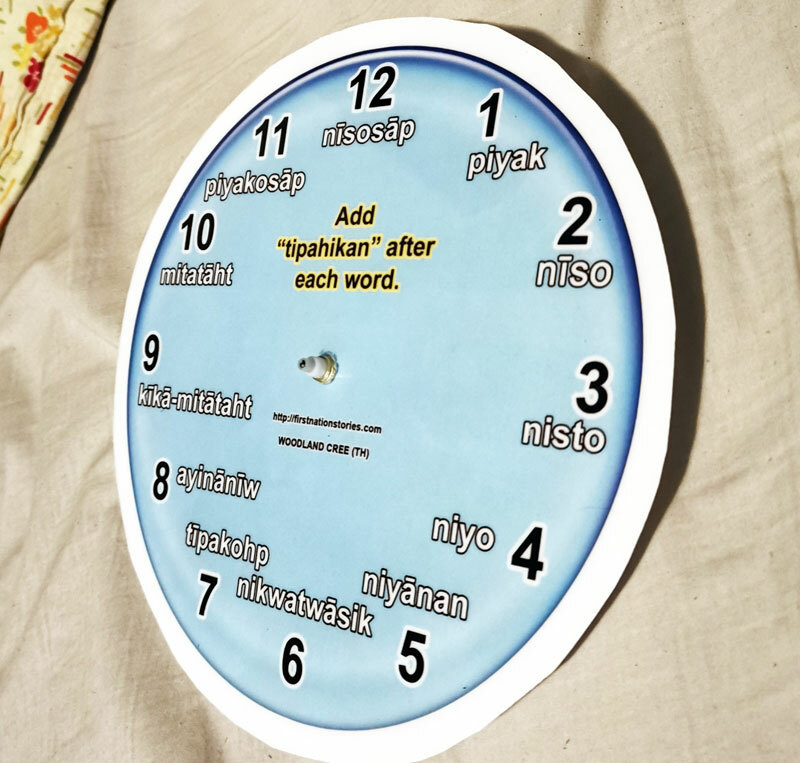 It’s hard to say how long the clock will stay straight, so I may have to get it laminated at some point.